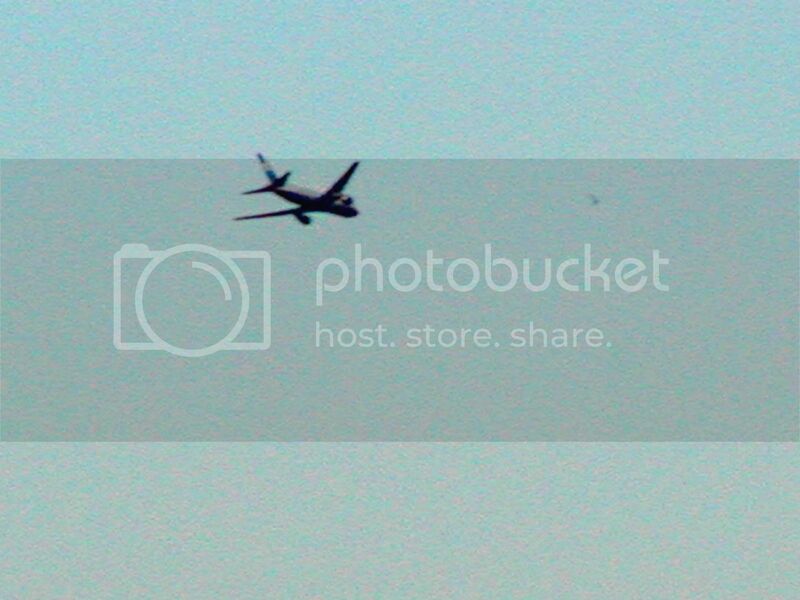 Photographs of the Second Plane, 9:02 A.M. Check out Sean's web version of his 9/11 photo set: http://www.adairproductions.com/photo/WorldTradeCenter/wtc.htm. UPDATE Sept. 2011: For best quality, see the 10th anniversary photo gallery at The Atlantic. Or see the 6 photo set in one image (source). UPDATE Jan. 2011: High resolution cropped version found by researcher Prishep, however the image is still blue tinted like in Sean's web version. See also digitaljournalist.org here or september11news.com here for more versions. "Sean started shooting with an SLR and multiple lenses at 14 years old, while travelling through 23 countries with his parents. Currently a freelancer and director of a small production company, who shoots and edits pro film and video, he also works extensively with digital manipulation in still and motion graphics; services all available from www.adairproductions.com. His photographs have been published in newspapers, books, and magazines around the world. With a background in travel stock photography and as an event photographer, his technical sophistication and eye for innovation have led to a body of truly unique photographic artwork." 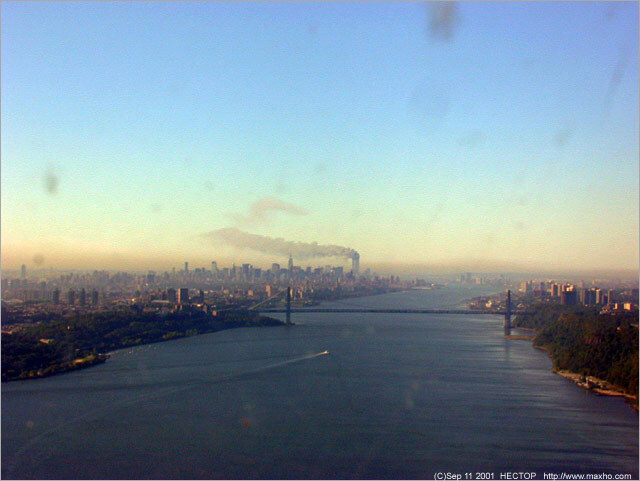 Ms. Barrer's photo of "Flight 175" was previously known as hereisnewyork.org #2356, the source for the above picture. UPDATE Jan. 2011: New larger version available. Click photo. The International Center for 9/11 Studies 2010 NIST FOIA has produced more than 4TB worth of data, which is being released over time in more than 30 chunks of various sizes. The hereisnewyork.org photo collection - featuring many larger versions - makes up 911datasets.org release 31. Click image to see the enlarged original. The plane is camouflaged by dirt on the scan of the print, but confirmed by a discerning eye. (Thanks to Prishep, who made the enhanced version above and sent it to me.) New to this list September 2011, self-published for the first time on the net in 2008. Source: photographer Doug's blog. Notice the explosion photo. Doug says the picture was shot from the roof of his building at 256 East 10th Street. 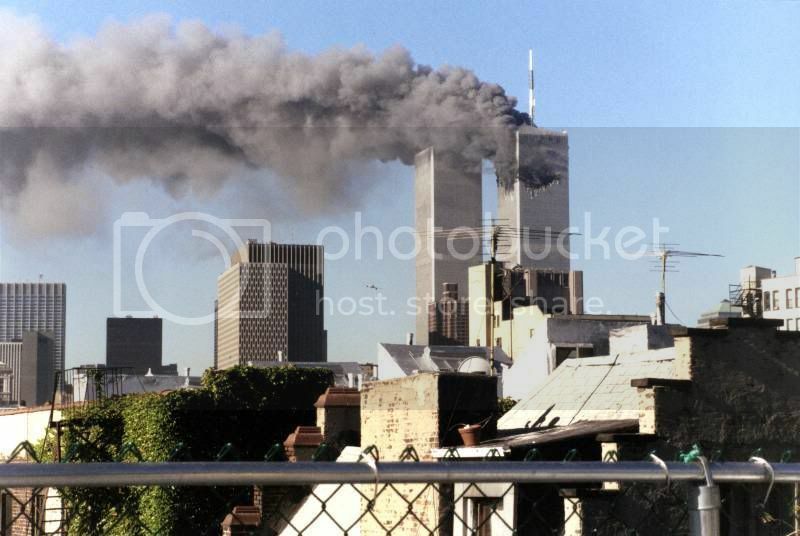 Here are my memories of 9/11 from when I photographed a supposed small plane crash into the WTC towers. I went up to the roof of our building 11 stories on 5th Ave /15th St in Manhattan. After seeing the 2nd aeroplane crash, I went to my local film lab for processing. Upon coming back I went up with more film and saw the 2nd tower collapse. Each series has more frames per insident [sic]. I'm getting goose bumps as I load these shots and tears are coming. Nikon F4 with 300mm f2.8 and 2x tele extender= 60mm. Exktachrome [sic] 100. UPDATE: Full resolution link. Notice the helicopter below and to the left. That's NYPD aviation unit #14, Officers Walsh, Hayes, Gromling, and Maier. Full details on the NYPD aviation photographs and video are studied in detail. Kathy holds a BFA in Graphic Design from Syracuse University. She has her own company, BuenaOnda Pictures. See the explosion shot now. The photos were shot from the roof of 475 Kent Ave., according to Clark in a phone interview by Jeff Hill. (EDIT: previously this page said "65 S 11th St, Williamsburg, according to researcher YougeneDebs." Coincidentally, UA175 videographer Chris Hopewell (aka Tinacart) has been pinpointed at the same block (building?). (40d 42m 27.90s N, 73d 58m 00.88s W. Ground elevation is 29ft; 6 story building) Again coincidentally, one of three people to capture the first plane "on film" - Wolfgang Staehle - was located also at 475 Kent Ave.
"Robert Clark is a freelance photographer based in New York City and works with the world's leading magazines and major publishing houses, as well as on cutting edge advertising campaigns. His work has won numerous international awards, graced the covers of several magazines, including more than a dozen covers of National Geographic and 40 book covers. His work has appeared in numerous publications, including Time, Sports Illustrated, French Geo, Vanity Fair, Stern, Der Spiegel. Currently involved with a variety of projects, Clark continues his association with National Geographic as well as a book documenting the birth of the science of evolution. He lives in Brooklyn, New York with his wife Lai Ling." Heal-Cotsifas Foto Inc., 601 W. 26th St #1801, New York, New York, 10001. The plane photo above was found as hereisnewyork.org #6588. UPDATE Jan. 2011: New larger version available. Click photo. The International Center for 9/11 Studies 2010 NIST FOIA has produced more than 4TB worth of data, which is being released over time in more than 30 chunks of various sizes. The hereisnewyork.org photo collection - featuring many larger versions - makes up 911datasets.org release 31. 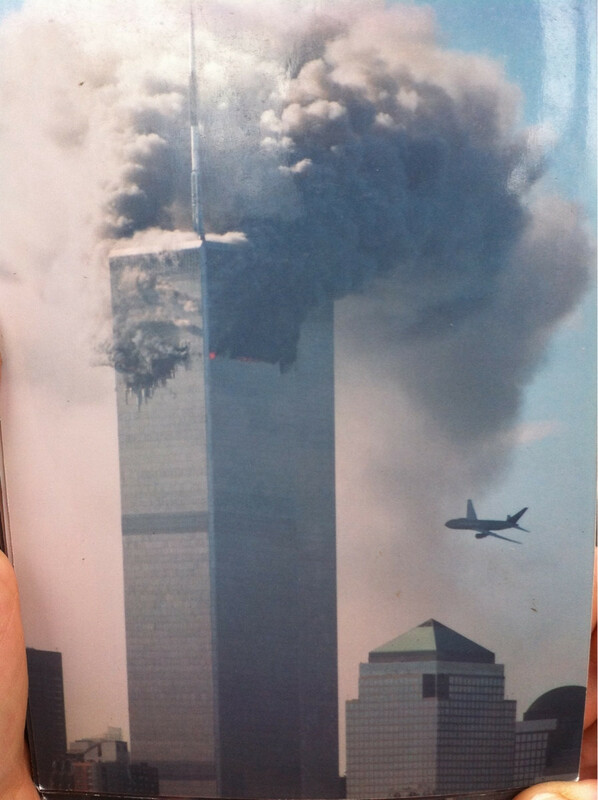 "This image just prior to the plane impact with the South tower still, a year later, puts a shiver down my spine. Image taken from Atlantic Basin due South of the site of the WTC." "Images during attack taken from Atlantic Basin by construction superviser [sic]." 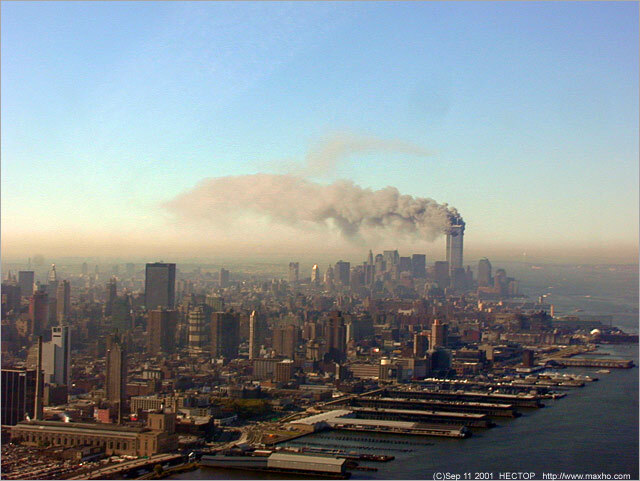 Cite as: Anonymous, Image #1157, The September 11 Digital Archive, 9 September 2002, http://911digitalarchive.org/images/details/1157 (cached). The plane pic - according to researcher YougeneDebs - was shot "at the end of Richards St at the docks, I think. 40d 40m 23.06s N, 74d 00m 56.12s W."
UPDATE 2017: Cumins was interviewed Sept. 11, 2014 by Unique Photo on YouTube. Conspiracy theories about fake planes, Cumin notes, can be disproven using his FUJI film negative (not seen). UPDATE 2012: The photographer was interviewed by Tom Franklin (photo "Raising the Flag at Ground Zero") for a 10th anniversary program, "Witness to History: The Photographers of 9/11." UPDATE July 2011: Cumin's set of photos -- including another shot of the plane -- have been discovered at corbisimages.com. Thanks, Prishep for the find. 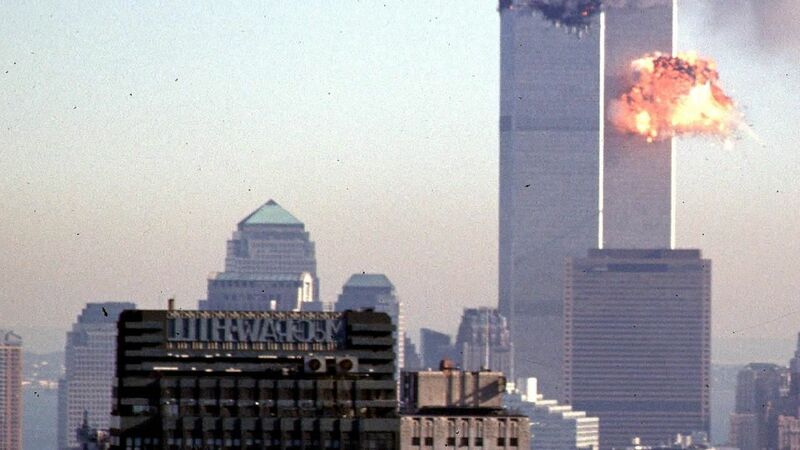 "It was not until I was at the (photo processing) lab, about to scan the film to CD did I realize the first two images were of the plane approaching and entering the south tower and then the fireball....that I had followed that plane right into the building! Ironically, the photograph was made with a Nikon 500 mm lens bought 8 years ago to the day, September 11, 1993....I would use it on September 13, 1993 to photograph the handshake between Rabin, Arafat and Clinton on the south lawn of the White House. The picture of the hijacked airliner a second away from hell on September 11, 2001 was made from the west of New York City, 18 miles away, while the sun was still in the Eastern sky, thus the silhouette and holocaust view." NEW addition to this list Dec. 2011. Uploaded to smugmug.com by user Dastata, who wrote for a caption: "I had just arrived at the pier and was told that an airoplane [sic] had hit the North Tower. I heard a loud "tearing" noise. Looking thru the viewfinder and Flt. 175 came into focus, I took the picture." 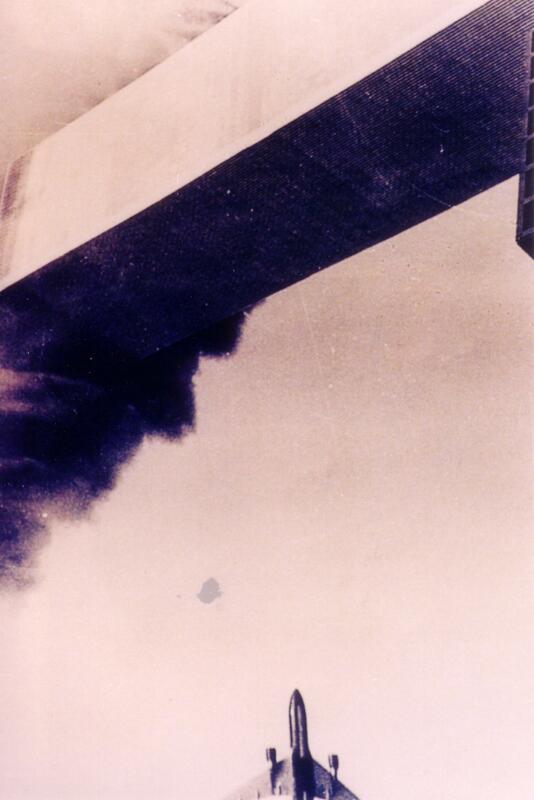 Under the explosion photo Dastata wrote: "I was suprized whenthe [sic] plane suddenly turned towards the East River (I was expecting it to go up the Hudson to inspect the incident) I found it in focus and snapped this as it hit the South tower." Copyright Laura Diez/eStock. Uploaded to webshots.com on September 20, 2001 by user andalusian95 into the Webshots "news" channel in her album titled "on my way to work images by Laura D...." Photo rediscovered Jan. 23, 2010 by researcher/archivist Prishep. Thanks! If anyone has better quality - or additional - photos, please contact me, matt -at- 911conspiracy.tv. UPDATE 2017: Changed name from "USYeh" to Dr. Harry Dym. Thanks All911rec for giving new source info (flickr), which names the photographer in Newsweek Sept. 2001, "extra edition" according to this cropped source. 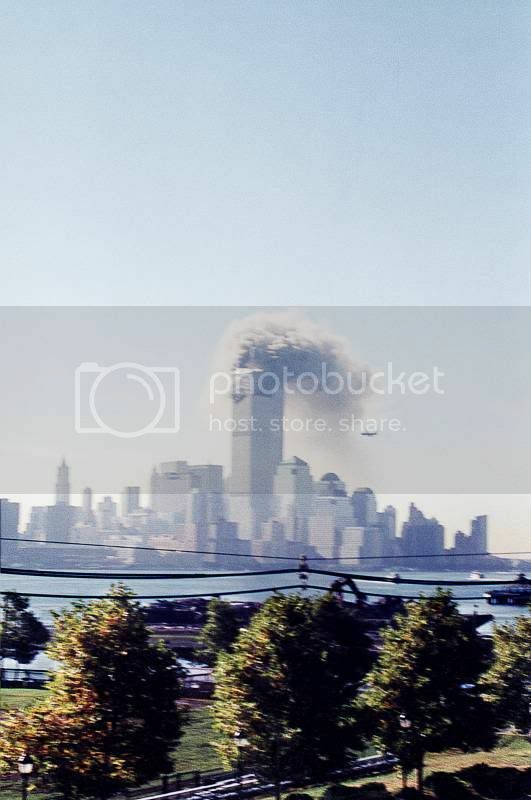 My friend took this shot on 9/11/01. As he tells the story, he was in northern Brooklyn the day of the event. He took out his camera and snapped shots after the first tower was hit. He was busy taking extra shots with his Nikon when he saw through the viewfinder that the second tower was on fire/smoking. He saw in the saved image, this picture below. 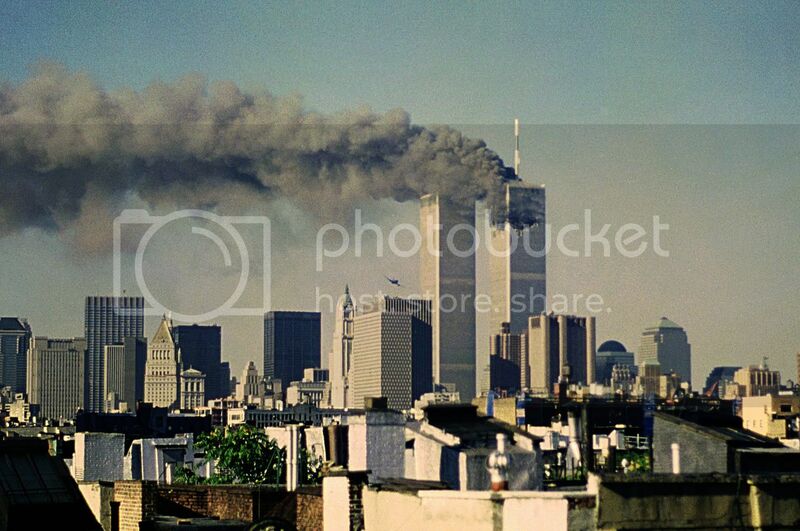 Apparently this shot was published in the center page of Time magazine's special edition regarding 9/11/01. Really sad to think that those folks in the plane died in about 1 second after the shot. Note that it was featured in the September 13 special edition of Newsweek magazine, as discovered when searching for the text on a scan of the photo from the pages... confirmed text match here. "My name is Robert. I was having breakfast at Joe Junior's in the West Village when a crowd starting to form outside. In short order, we learned the World Trade had suffered some catastrophe. After taking a look at the black gash in the facade of the building, I abandoned breakfast and ran to my apartment across the street and grabbed my camera. It was loaded and ready (I'd just gotton back from Florida several days before). I snapped a few pictures and saw the second plane in my viewfinder. I snapped it instinctively. 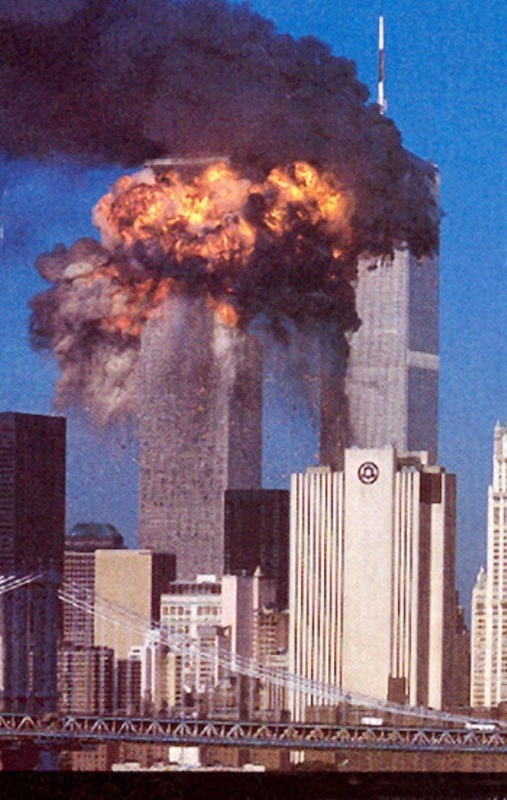 I had no idea it was going to hit the south tower." Cite as: Robert Fisch, Image #515, The September 11 Digital Archive, 3 August 2002, http://911digitalarchive.org/images/details/515. 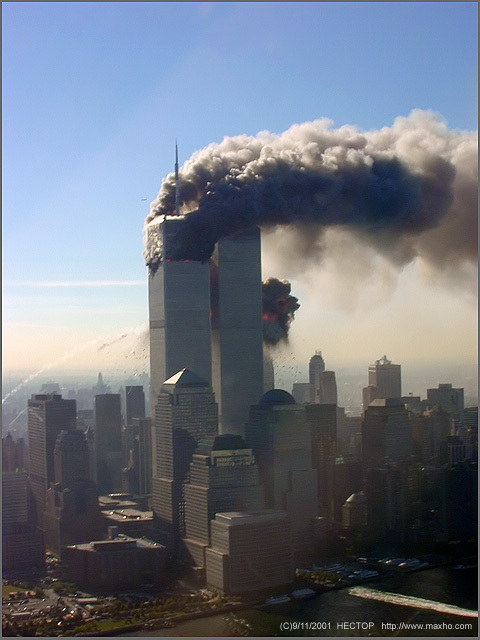 "My camera was trained on the towers when the second plane came into view. The picture I took of the airplane should be in the repository. As viewed from the north, the plane appeared to vanish. When the building erupted in flame, I still had this "disconnect" in my mind and at first refused to believe the plane I'd just seen hit the building. After a few seconds when the sound wave reached us, it was fairly clear that was what happend [sic]." 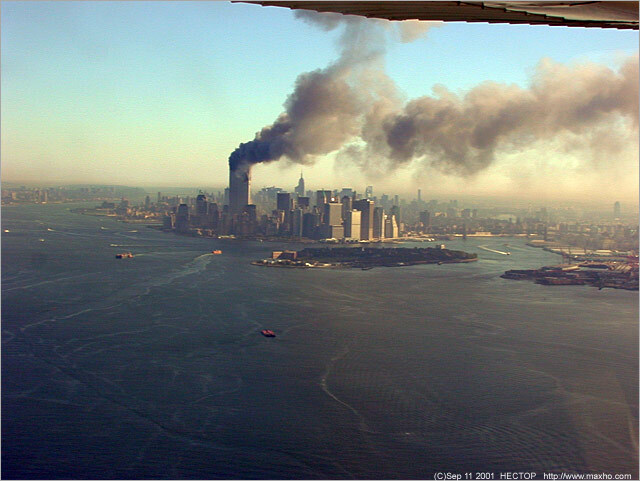 Cite as: Robert Fisch, Image #516, The September 11 Digital Archive, 3 August 2002, http://911digitalarchive.org/images/details/516. "After my first shot of the fireball, I was frozen like I was in a trance. Everything seemed to be happening in slow motion. When the sound wave reached us (it sounded just like in the movies, only not so loud---then again, I was probably 2 miles away)....it brought me back to reality and I snapped this picture." 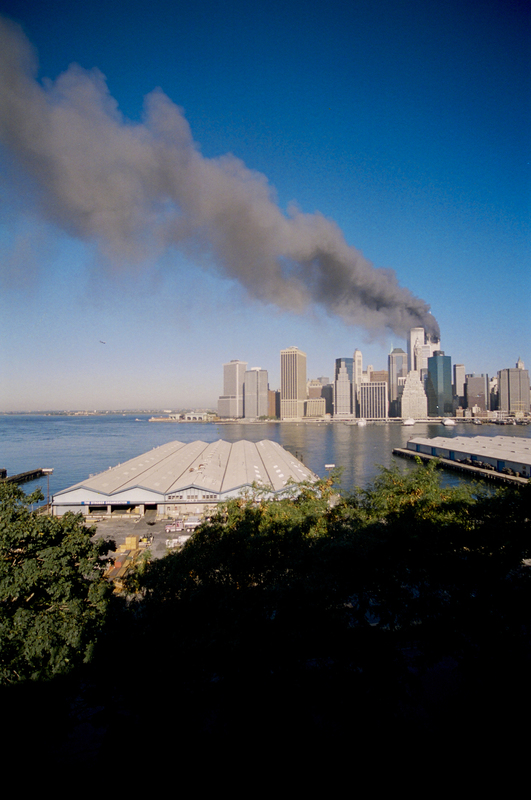 Cite as: Robert Fisch, Image #517, The September 11 Digital Archive, 3 August 2002, http://911digitalarchive.org/images/details/517. Kelly snapped two quick shots of the plane, like Robert Clark. UPDATE March 2011: A high resolution version of her second shot was included in the new 9/11 Memorial interactive timeline. See other closeups of her second photo, or a video with her story from the New York Times, the original publisher. Her domain name www.kellyguenther.com forwards to nycweddingphotographer.com, which tells us "she is a photojournalist who shoots weddings." Sources for the above photographs include http://www.nytimes.com/packages/html/photo/20011231YIP/pho_YIP_214.html, http://www.nytimes.com/slideshow/2002/04/08/national/09puli.1.slideshow_1.html, and for the closeup of plane shot number 2: http://www.fotopolis.pl/index.php?g=23&aktz=7. UPDATE Jan. 2011: New larger version available. Click photo. The International Center for 9/11 Studies 2010 NIST FOIA has produced more than 4TB worth of data, which is being released over time in more than 30 chunks of various sizes. The hereisnewyork.org photo collection - featuring many larger versions - makes up 911datasets.org release 31. "At Rector Street and Broadway, a photographer leaned out his window with a medium-format camera and caught the moment before the second plane's impact. Photograph by Rob Howard." - vanityfair.com NOTE from YougeneDebs regarding the point of perspective, confirming Rob Howard's memory: 40d 42m 26.04s N, 74d 00m 42.66s W. Ground elevation is 31 feet. "Rob Howard was at the window of his apartment on Rector Street and Broadway. A photographer accustomed to shooting travel, lifestyle, and portraiture, with medium and large-format cameras, Howard leaned out over the sill. He shot up at the bold, vaulting lines of the structure with a Pentax 6x7 just as the plane 'flew over our building and slammed into the south tower,' he says. 'It seemed to take forever. Time stood still.' He rendered the moment right before impact in finely detailed black-and-white, as if he were on an architecture shoot." - David Friend, Watching the World Change: The Stories Behind the Images of 9/11, Farrar, Straus and Giroux, New York, p. 14. UPDATE 2016 from my Facebook page and linked here in 2017: NEW scans (plane [zoom detail] and explosion, with incorrect text timing the impacts at 8:48 and 9:06!) in high resolution, from a full 2-page version in September 11, 2001: A Record of Tragedy, Heroism, and Hope, Harry N. Abrams, Inc., New York, 2001, pp. 12-13. High quality. NOTE that a 2008 documentary "The 9/11 Hotel" attributed the photo to Christine Sweeting's daughter... in a[nother] blatant error by UK Channel 4. UPDATE: Hi res (photo of original photo) found on reddit.com. New addition to this webpage January 2010 thanks to researcher Prishep, who found the rare plane photo here. After some searching, two other Joyce photos have been located. Sources for the three seen above: another search at Corbis. Click the 3rd photo to see a larger version from a Picasa web album that happens to contain another NEW find (also from Corbis) by Prishep! See below, Masatomo Kuriya. 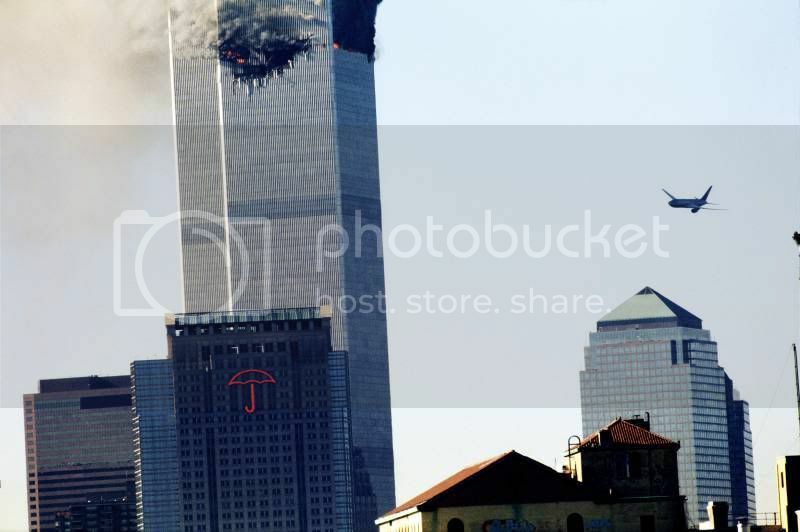 UPDATE: Photographer named after finding the image in One Nation: America Remembers September 11, 2001 by Life Magazine, 2001, p. 24... where the white paper (I guess) floating above the plane is airbrushed out and the image cropped to cut out the smoke, so the book could simulate a shot of the first plane hit (Frames from the Naudet 1st hit shot are on the opposite page). The International Center for 9/11 Studies 2010 NIST FOIA has produced about 4TB worth of data, which is being released over time in more than 30 chunks of various sizes. The hereisnewyork.org photo collection - featuring many larger versions - makes up 911datasets.org release 31. Find the photo filmstrip in subfolder "SET1." UPDATE 2013: Full portrait view found non-cropped as International_Center_for_911_Studies_NIST_FOIA\Release_37\. \42A0528 - G38D7\MikeDavisfromCD\CD2\&wtc2.JPG. Added here January 2010 thanks to researcher Prishep, who discovered it here at Corbis. The source for the above version without the watermark comes from a Picasa web album (now a dead link). 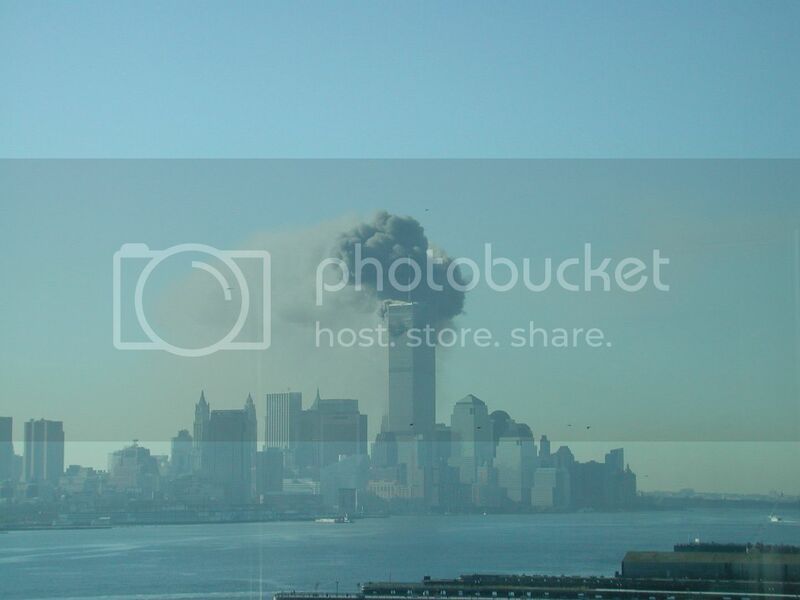 See Masatomo Kuriya's full 9/11 collection, although in low quality. 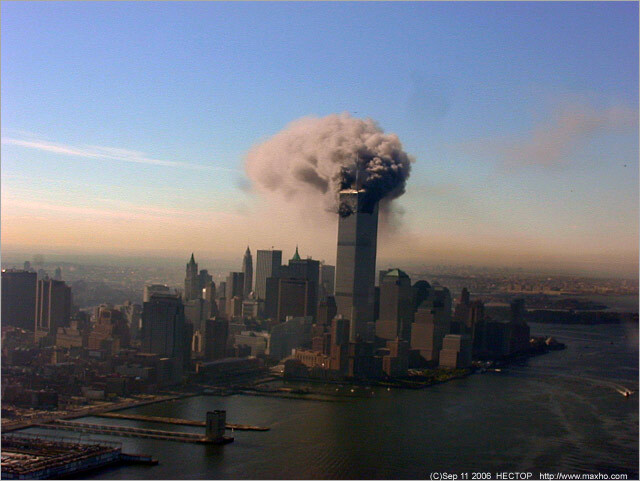 In 2011 the photo was featured on the cover of composer Steve Reich's "WTC 9/11" album. According to perspectivist YougeneDebs, the shot was taken "[f]rom the top portion of the East Hampton Apartments, 30 River Court, Newport Center - Towers of America, Jersey City, NJ. The Emporis Description is here. The plane is about 260 ft shy of impact, by my calculations." UPDATE: Aug. 2013, National Geographic's site natgeotv.com used the explosion photo but flipped the image horizontally for a less-recognizable mirror image (more obvious when not cropped like on the webpage.) I guess they didn't ask Seth for permission. Larger images from a picasaweb.google.com search for wtc plane: 1. & 2. New to this list March 22, 2010, thanks to Muzza (in his/her first post at pumpitout forum). About the photographer: it seems Moreau - a virtual unknown - sold his photo(s) to the newspaper USA Today in a one time deal (see pdf or full-size jpg image). The image was rediscovered at a herald-dispatch.com 9/11 photo gallery, which credited the image to "Gannett News Service, Fabien Moreau/USA Today." Note that Gannett Co. Inc. publishes/owns the USA Today newspaper. Apparently the company owns 83 daily U.S. newspapers, and more than 650 magazines and other non-dailies (according to Google Finance). The only other source for Moreau's airplane image found so far is a usatoday.com graphic, in poor resolution. Point of perspective: "Seems to be from the roof of 83 Chambers St; the building on the left fore-ground is 86 Chambers St." (Thanks, Debs) Also, 50 Murray St is visible in the lower right mid/foreground... the building impacted by the starboard engine of the plane. See the damage. Note that "www.p-fotos.com" doesn't return a website. The Internet archive finds nothing for that domain name. Three choppers are captured in Paul-M's set. Left of the towers is Chopper880 for WCBS-AM radio (also recording video for ABC). One on the right belongs to the NYPD (at least one). Pat Walsh and Tim Hayes, pilots. No information is found for the photo on hereisnewyork.org, the source linked above. 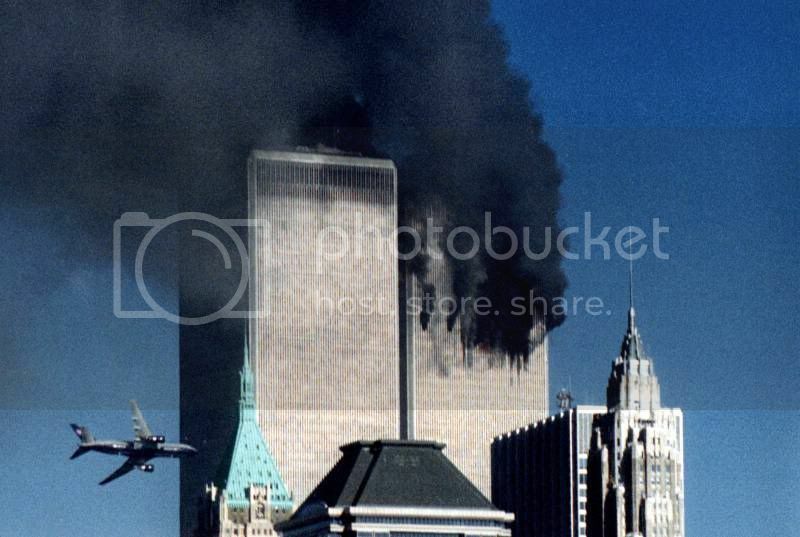 However, a different version (a scan of the print, full version - 3712 x 2416 px) was found at the 9/11 Digital Archive. (link updated 2015) Click the photo at left to enlarge. 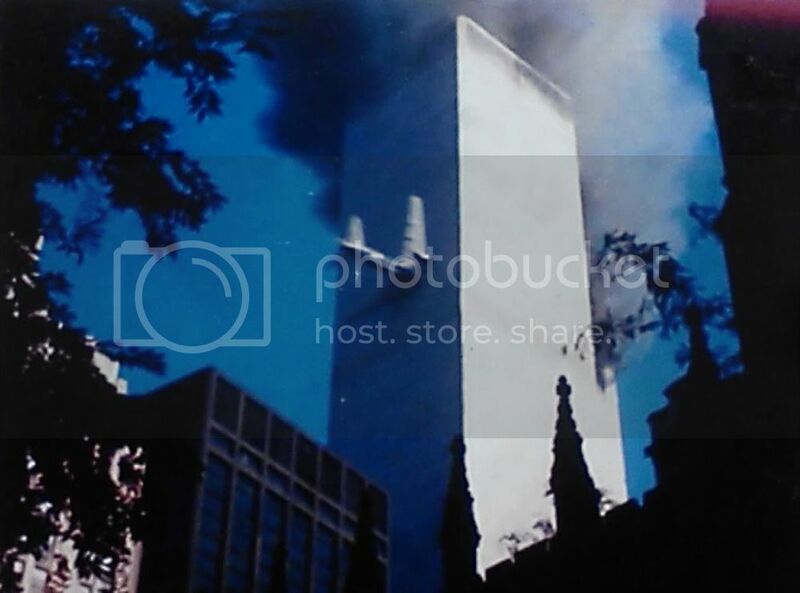 At the 9/11 Digital Archive, we learn the photo was contributed/uploaded by Dan Perez, the officer/photographer's son. "Contributor's location on 9/11: I was in school wondering what was going on and if my father was alive. NOTE: This photo does not show the plane. The speck is too small, and in the wrong place. We can see this photographer fly across the screen in 3 of the 2nd hit videos! 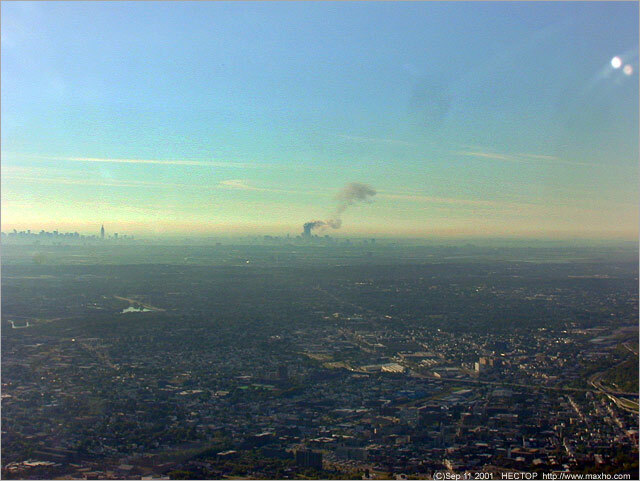 Watch WNYW FOX Chopper5, FOX5 9:09 am ("Marta"), and WPIX Air11. Here's a video explanation of the time difference in the flyby in two of those videos, since Simon Shack thinks it's evidence of "fakery." Here is a shocking story of Russian pilot, now living in the USA who was on the air 9th September 2001 [sic] and have made photos right from the air when planes crashed the WTC. He worked at that time as a programmer in one of the dot coms and had some free time which usualy he spent flying Cessna 172SP plane around NYC. We have this photos today. And then suddenly this BOEING 737 changes his course making a very sharp curve, targeting the South WTC tower. After that he decided to find a place to land but all the places around NYC didn't accept him so he had to fly to NJ and land there. He hid the camera so that nobody could know he was filming. "As I'm flying closer, almost opposite the WTC, right next to the Harborside Center in Jersey City, I see this airliner coming down in a steep bank, my first thought was, WTF is this guy doing!??? Why is he diving so steep to take a look at the fire! And it's an airliner! (looked like a 737 to me at the time). I muttered something along the lines 'Jeez, this guy is gonna get so fired by his airline, it's not even funny!' The next moment.... it hits the building.... I felt like I was inside a cartoon or a movie, maybe that 'Independence Day' flick, at the moment I thought I was seeing things, like this can't be, this isn't real... But I had my camera in hand and snapped virtually a split second later after the impact, I was simply too awestruck when I saw the plane, so it didn't click in me to actually shoot the thing (but if I had a Stinger SAM with me, damn, I wish I did and I would)." To investigate speeds and distances involved in Yuri's flight, see the study by YougeneDebs. Plus, here are Debs's coordinates for the flying Russian: "High above, near the Hoboken PATH Station 40d 44m 03.67s N, 74d 01m 21.75s W. Altitude of Yury's Cessna is about 750 feet." NEW FIND by ALL911rec of pumpitout forum. Originals, apparently, come from areksgallery on Flickr, plainly titled "Photos by Peter Sabla. The download page on Flickr says with some confusion: "All rights reserved by Arek Kwolek." NEW FIND by Prishep of pumpitout forum. Only this small version so far has been published, from the New York Daily News online. 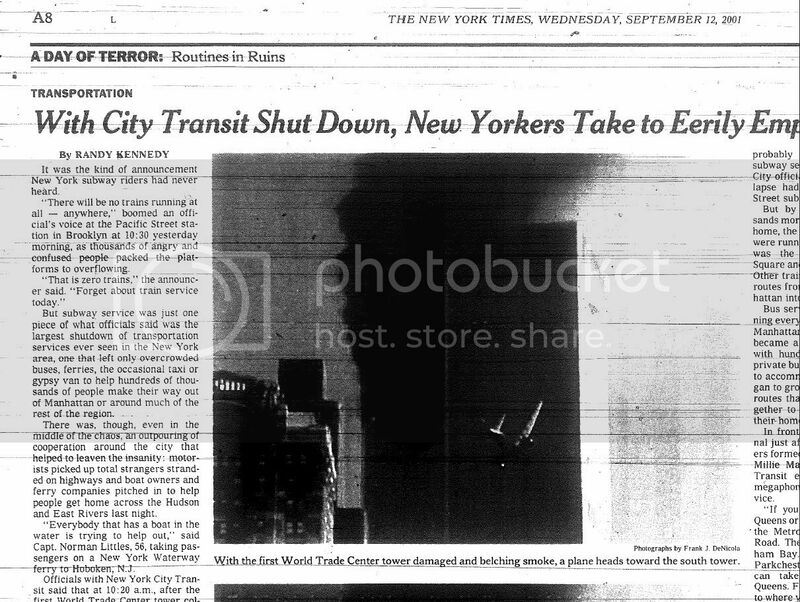 (A Google images search for "Kamal Sharma 9/11" finds the source image seen above, seen smaller in the article). The point of perspective for the map below is to be determined... a vantage point similar to Diez, above. NEW FIND June 2014. Thanks, All911rec at YouTube. Photo 1 source. Photo 2 source - (which seems to be a crop of a larger photo that is missing from the set. Learn more about the photographer at lauriegarrett.com, where the photos were found (at another page) in a set of more than 20 shots all taken before the towers collapsed/exploded. FYI, The larger sized originals had urls hidden in the xml site map. NEW FIND April 2015. Thanks, ALL911rec. See the explosion photo here. The point of perspective is to be determined. Exif metadata is found on the photo, a rare treat which adds weight to the image's authenticity. The Olympus camera time was apparently set 10 minutes fast (2001:09:11 09:13:19). NEW FIND July 2011. Thanks, MrKoenig. See the explosion photo here. The point of perspective, according to the source: 40.600273, -74.086728, on "top of the Staten Island Advance building in Grasmere." 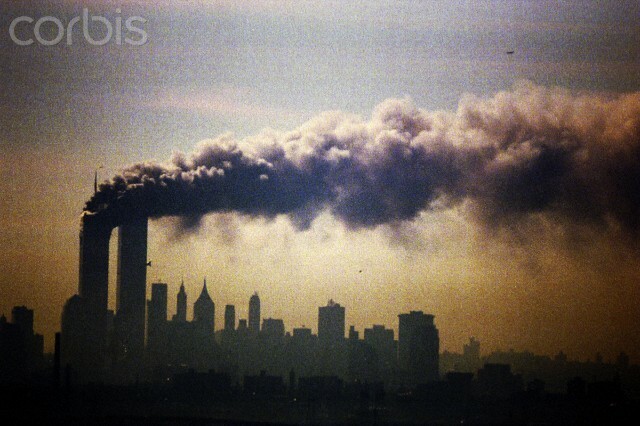 "11 September 2001 Andrea Tavares saw with [her] own eyes what was happening to the Big Apple. [She] went up with a friend to the roof of his building , where he saw the second plane approaching the Twin Towers . The first two photos were taken by Peter Slootweg on the day of the attacks . The rest are Andreia Tavares, on the same day, and on September 23, when he visited Ground Zero." - Google translate version of text from Portugal news website Sic Noticias. Published online Sept. 10, 2006. NEW FIND Sept. 2014. Thanks, 911allcausticcamera aka All911rec. See the explosion photo here. UPDATE: Name change from "ICIS News" to J. Sullivan, after finding the photo set (in various quality levels and sizes, in no particular order) in International Center for 9/11 Studies NIST FOIA release 29 in the folder here: 911datasets.org\International_Center_for_911_Studies_NIST_FOIA\Release_29\Release 29\42A0325 - G29D11\WTCI-412-STB SIPA. The photos came among 29.4GB of other photos and videos. 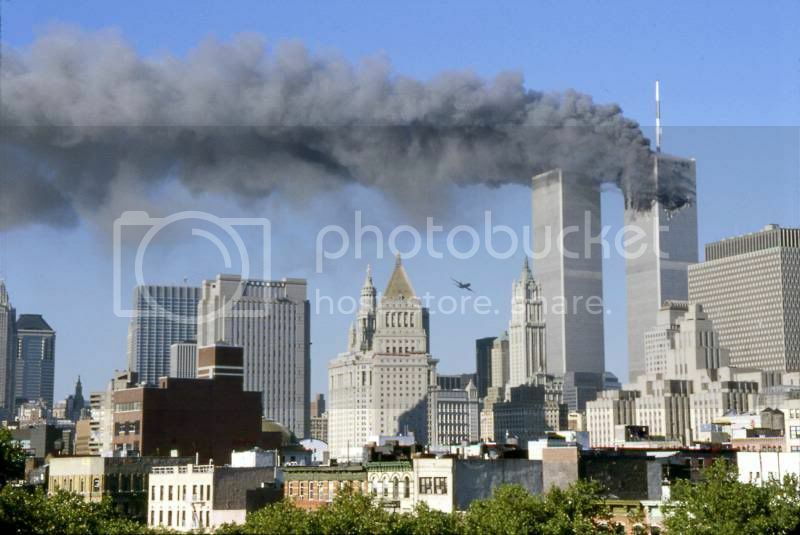 Details in metadata from plane pic: "11 September 2001 - New York - Series of pictures shows the second plane attack on the World Trade Center September 11, 2001. PHOTO CREDIT: John Sullivan / SIPA PRESS." New addition April 2010 thanks to researcher and archivist Prishep. Sadly the photo has no credits on the source webpage, <http://www.icis.com/Articles/2008/09/11/9155508/insight-us-safer-since-911-but-threat-remains.html>. Bad journalism Joe Kamalick, and/or bad publishing job, ICIS. UPDATE 2012: The Arkansas tourist was interviewed by Tom Franklin (photo "Raising the Flag at Ground Zero") for a 10th anniversary program, "Witness to History: The Photographers of 9/11." Much has been written about this award winning photograph. Interestingly, it appeared in the 9/12 New York Times credited to somebody else - Frank J. DeNicola (Note the online version has no photos just photo credits, but the microfilm version at the library does.) Again, DeNicola is credited at covillephotoartcollection.com.... Read an archived article by David Friend describing Carmen's experience handling the rights issues. Initially, a stranger named Doug Haluza helped Carmen get the images on the Internet to her local Arkansas media friends. Hear a recorded phone interview with Haluza, thanks to Jeff Hill of pumpitout.com. Another interview asks AP journalist Robert Bukaty to help explain the photo he took of Carmen holding her camera published with two different images on the screen. 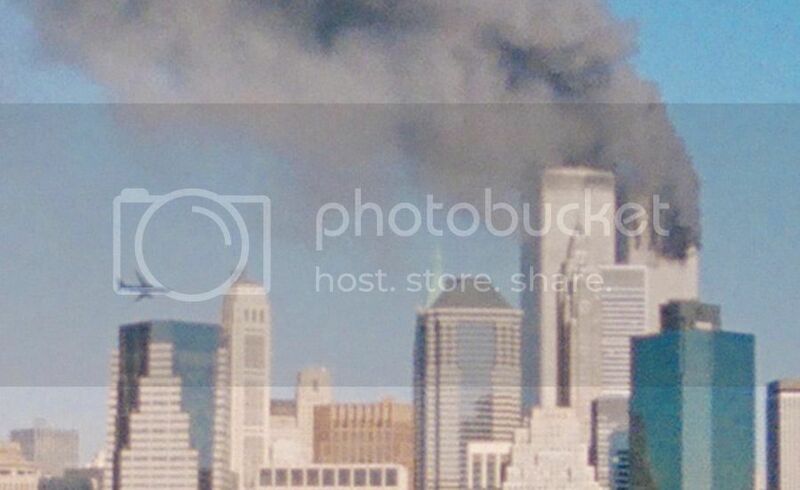 Suspicious conspiracy theorists point to this AP photoshop job as evidence of media complicity in 9/11. See the pumpitout forum thread built around Jeff Hill's recorded conversation with Ms. Taylor... and others involved. Another pumpitout thread revolves around communicating with Carmen (heidimarie) yourself. If you recognize the angle of this photo from a familiar video of the impact, you're thinking of the Hezarkhani/CNN shot. Very close cameras. 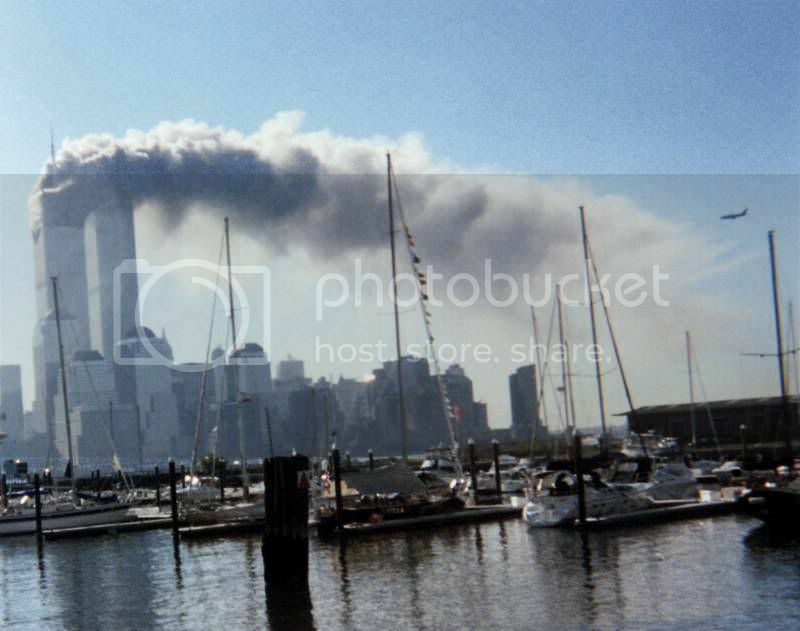 Point of perspective: "On board a ferry at Station #4 in Battery Park; about 40d 42m 08.01s N, 74d 01m 00.61s W."
To answer the blog's question: Yes, in my opinion it is a real shot from 9/11/2001 at 9:02:59 am EDT. Exact point of perspective: not yet mapped below. NEW FIND September 2011 at atheistnexus.org, thanks to researcher Prishep at pumpitout forum. Photo posted online by a friend of the photographer. "By one of my old skating partners, John C. Vanover...he was working on the Jersey side of the river that day. You can see the second plane at the right end of the smoke plume. It still makes my stomach churn to look at this." Exact point of perspective not yet determined, so it's not yet added to the map below. "Photo taken by Joe Vazquez at the Gowanus Gas Turbine site. 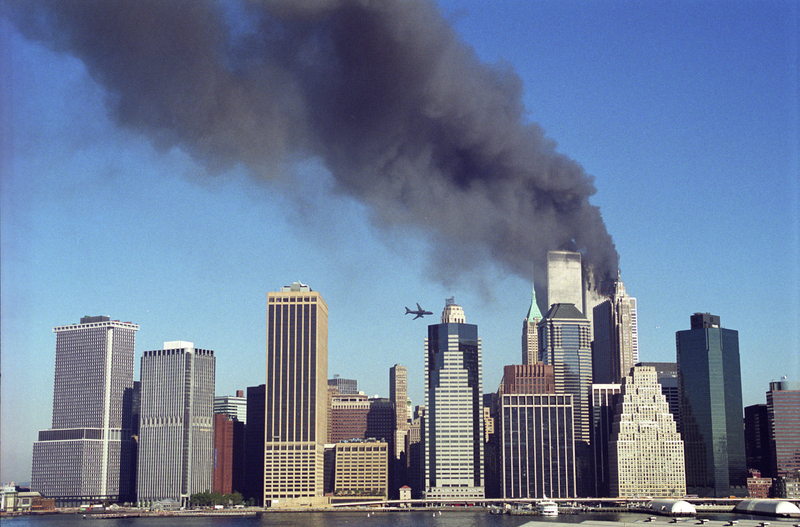 The first plane has crashed into the south tower. The second plane has targeted the other tower. A lone seagull is perched on a coal mound. Striking contrast!" Found at the 9/11 Digital Archive by researcher Alibongo. United Airlines Flight 175, an instant before impact with the south tower of the World Trade Center. Taken from the park at City Hall, 3 blocks from the Trade Center. This incomplete map is nothing compared to the world of 911maps.wordpress.com. Go. This collection and archive are not affiliated in any way with the publishers of these materials.